Friday, Friday! FRIDAY!!!! And Saturday, Saturday! SATURDAY!!!! 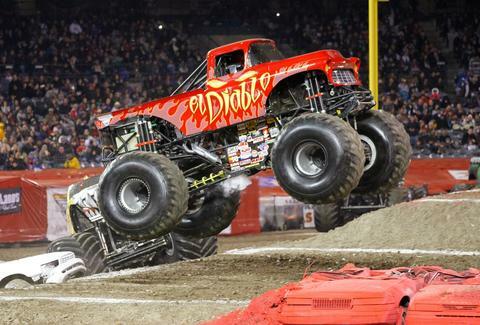 Win your tickets: Advance Auto Parts Monster Jam is bringing Grave Digger, El Diablo Loco, and others to the BB&T Center for some car-smashing fury. And we’re giving two lucky readers a pair of tickets to Saturday’s 230p show. Just tweet out this Playbook with #MonsterJamTix, and you could be going for free, free! FREE!!! Friday, August 16th Throw some rocks at Bird Bowl from 7-10p, where $25 gets you two hours of bowling, shoes, a pizza, a soda, and a t-shirt, plus the priceless feeling that comes from helping save endangered rhinos in Africa, of course. Call the zoo to sign up! Beat the Summer heat and celebrate National Rum Day when Brother Jimmy's has a root beer float social on their patio with $6 Sailor Jerry’s Root Beer Floats from 4-6p. Saturday, August 17th Two-time defending champ Team Brunette defends their Powderpuff Football title against Team Blonde while you enjoy free “Kill the Barrel” rum drinks, play on a slip-and-slide, and eat barbecue at Mermaid Bowl IV on the beach at Ocean Manor. VIP tables, EndZone boxes, and GA tickets are all right here. Tuesday, August 20th Baoli has poached Nobu’s chef and unleashed a brand new sushi-heavy menu that you can try all of for HALF OFF every Tuesday from now until October. Oh, that Miami Spice. Try some high-end tequilas that’re too good to shoot and pair them with crazy tamales filled with stuff like smoked duck, crab, and goat cheese & mango at Devon Seafood and Steak from 7-9p. Calling all home-brewers! Do you have an awesome homebrew you think is deserving of the Thrillist name? We’re looking for one local brewer to represent us at the Riverside Market Endless Summer Home Brew Contest on September 21st. Tweet us about your beer and the winner’ll get free entry and a chance to win some serious cash prizes.